Nearly a month after the Greeley-Andersonville Prison cartoon, Nast represented the Democratic victory in the Georgia state elections as an ominous turning point in the lives of Southern blacks. Over the bodies of two murdered black men, Greeley clasps hands with a former Confederate soldier, who hides a gun behind his back and stands with one foot on the American flag and the other foot on the back of one of the black men. 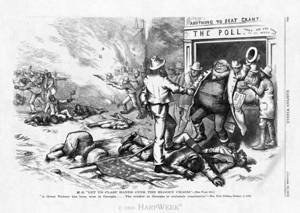 Behind Greeley, some Southern white men cast their ballots, while in the left-background others open fire on a group of black men. The question on the polling place—“What are you going to do about it?”—was “Boss” Tweed’s alleged response to inquiries into the corrupt practices of Tammany Hall. The message of this cartoon is clear: Greeley’s trimming of his principles for the sake of political office will result in disaster for, and perhaps the extermination of, Southern blacks.